Master the art of hot stone massage. This video will show you everything you need to know to begin your hot stone massage practice. You will learn about the various types of stones, textures and shapes as well and the benefits and cautions related to stone therapy. Then Carollanne Crichton will lead you through a basic hot stone massage utilizing foundation layouts and hot stone massage techniques. She clearly shows where to lay each stone, and gives the reasoning behind the size and placement of the stones. She will lead you step by step through the entire routine. After addressing some frequently asked questions, Carollanne then shows a cool moonstone facial massage. This can be incorporated into an actual facial, or done on its own. The innovative use of cool stones is an amazing addition to any hot stone practice. Cool and warm stones can be used together to give an incredible stone massage session. Finally Carollanne introduces six advanced restorative protocols that cover a variety of dysfunctions. In each protocol you will learn how to evaluate your client, and then where to place the stones to benefit each dysfunction. Finally she shows how to trace each meridian to help balance the body. These protocols are advanced stone massage techniques that will help any stone massage therapist’s practice. These protocols also take the stone massage and make it unique. If you are wanting to really master this art, then Carollanne’s stone massage will reveal incredibly creative uses that you may have not thought of before. 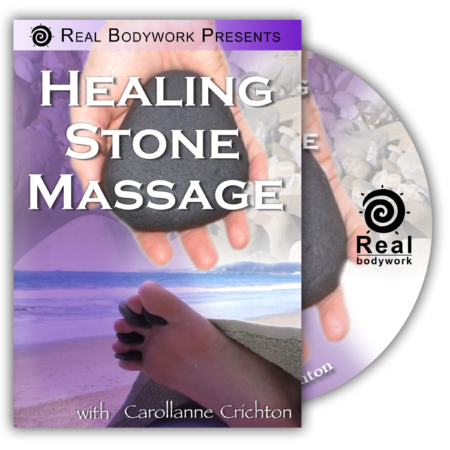 Carollanne Crichton has been practicing stone massage for over 20 years. She has pioneered stone massage when it was just becoming popular. She taught stone massage around the country, helping to popularize the modality as it became popular in spas. She loves to incorporate stone massage into other modalities like sports massage, meridian therapy, and side posture. She is a skilled Ayurvdic practitioner, Yoga instructor and massage therapist with a great love for healing.